"Universal man" redirects here. For the sculpture by Canadian artist Gerald Gladstone, see Universal Man. For other uses, see Polymath (disambiguation). Polymaths include the great thinkers of the Renaissance and the Enlightenment who excelled at several fields in science, technology, engineering, mathematics, and the arts. In the Italian Renaissance, the idea of the polymath was expressed by Leon Battista Alberti (1404–1472) in the statement that "a man can do all things if he will". Embodying a basic tenet of Renaissance humanism that humans are limitless in their capacity for development, the concept led to the notion that people should embrace all knowledge and develop their capacities as fully as possible. This is expressed in the term "Renaissance man", often applied to the gifted people of that age who sought to develop their abilities in all areas of accomplishment: intellectual, artistic, social and physical. "Renaissance man" redirects here. For use as a title of cultural works, see Renaissance Man. "Renaissance man" was first recorded in written English in the early 20th century. It is now used to refer to great thinkers living before, during, or after the Renaissance. Leonardo da Vinci has often been described as the archetype of the Renaissance man, a man of "unquenchable curiosity" and "feverishly inventive imagination". Aside from "Renaissance man" as mentioned above, similar terms in use are homo universalis (Latin) and uomo universale (Italian), which translate to "universal man". The related term "generalist"—contrasted with a "specialist"—is used to describe a person with a general approach to knowledge. The term "universal genius" or "versatile genius" is also used, with Leonardo da Vinci as the prime example again. The term is used especially for people who made lasting contributions in at least one of the fields in which they were actively involved and when they took a universality of approach. When a person is described as having encyclopedic knowledge, they exhibit a vast scope of knowledge. However, this designation may be anachronistic in the case of persons such as Eratosthenes whose reputation for having encyclopedic knowledge predates the existence of any encyclopedic object. ^ The term was first recorded in written English in the early 17th century Harper, Daniel (2001). "Online Etymology Dictionary". Retrieved December 5, 2006. ^ a b "Ask The Philosopher: Tim Soutphommasane – The quest for renaissance man". The Australian. 10 April 2010. Retrieved 27 July 2018. ^ "Renaissance man – Definition, Characteristics, & Examples". ^ Harper, Daniel (2001). "Online Etymology Dictionary". Retrieved 5 December 2006. ^ "va=Renaissance man — Definition from the Merriam-Webster Online Dictionary". M-w.com. Retrieved 6 April 2012. ^ "Oxford concise dictionary". Askoxford.com. Retrieved 6 April 2012. Araki, M. E. (2015). 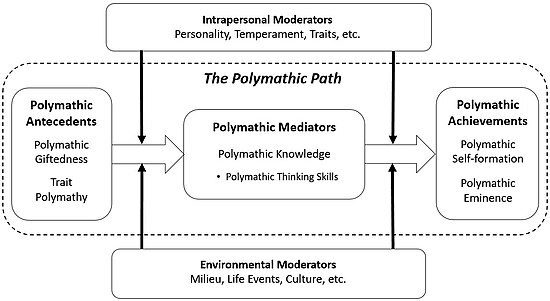 Polymathic Leadership: Theoretical Foundation and Construct Development (Master's thesis). Retrieved 29 January 2018. Burns, Peter, "What makes a Renaissance Man?". Carr, Edward (1 October 2009). "Last Days of the Polymath". Intelligent Life. The Economist Group. Retrieved 12 January 2017. Edmonds, David (August 2017). Does the world need polymaths?, BBC. Frost, Martin, "Polymath: A Renaissance Man". Mirchandani, Vinnie, "The New Polymath: Profiles in Compound-Technology Innovations", John Wiley & Sons. (2010). Twigger, Robert, "Anyone can be a Polymath" We live in a one-track world, but anyone can become a polymath – Robert Twigger | Aeon Essays. Wiens, Kyle, "In defense of polymaths".